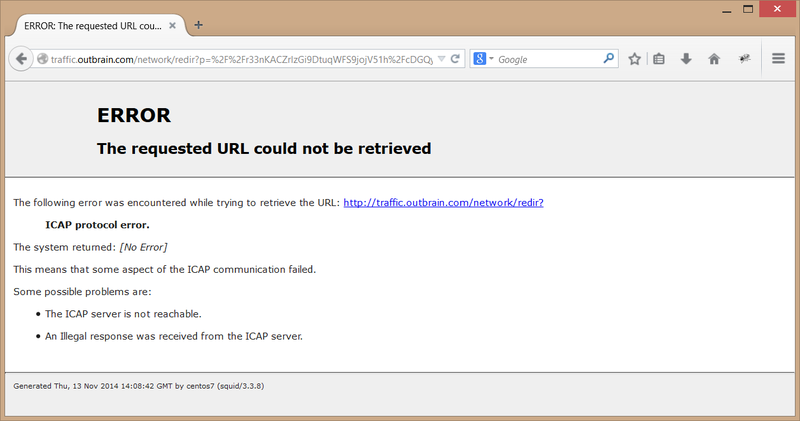 When something is wrong with ICAP communication channel between Squid and wsicapd daemon, users may see the ICAP error page that looks like this. This means Squid was not able to contact the wsicapd ICAP daemon running at port 1344 and thus stopped the HTTP/HTTPS transaction. There are two possible reasons for ICAP error like this - either wsicapd daemon has crashed or Squid cannot connect to the wsicapd daemon due to incorrect configuration or internal limitations.